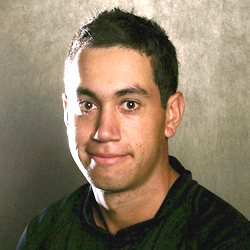 Ross Taylor (born 8-Mar-1984; Lower Hutt) is a right-handed middle order batsman and right-arm offbreak bowler, who plays international cricket for New Zealand. He made his international debut in ODI against West Indies at Napier on March 1, 2006. 20-02-2019: Ross Taylor became New Zealand's highest run-scorer in ODIs after he crossed Stephen Fleming's 8,007 runs during the third ODI against Bangladesh in Dunedin. 22-Feb-2017: Ross Taylor became New Zealand's most prolific one-day international century maker, he breaks Nathan Astle 16 ODI centuries records. 21-Dec-2013: Ross Taylor's 11th Test century in the third Test against the West Indies also saw him become only the second New Zealand player to score centuries in three consecutive Tests after Mark Burgess.